This curved and salvaged beauty is seeking a new home. In need of a swanky, stylish seating area? WALK INTO ONE of Seattle’s salvage stores and you’re bound to find stories. That old chair? It’s not just any old chair. That’s from a well-known Ballard dive bar that was recently torn down. A patron carved his (or her) initials into the right arm 40 years ago. Salvaged furniture offers tiny pieces of history. This beautiful bar? It holds a piece of Burien’s history. The bar belonged to Gilbert LeBaron Duffy Jr., who died in 2009 at the age of 92. Duffy and his wife, Cookie, who died in 2006, were Burien community leaders. The bar is from their home in Burien’s Seahurst neighborhood. 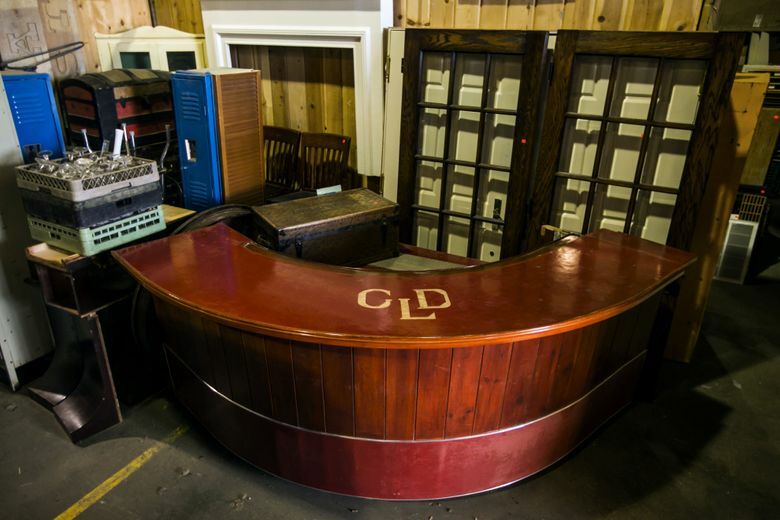 It has wood paneling on the sides, a red counter and the initials GLD inset in the top. The back side has cabinets underneath and a lower counter, with built-in lighting, for storing glasses and making drinks. 1440 N.W. 52nd St. Ballard. In the Burien home, the bar was paired with a red side table and built-in booth seating. The seating didn’t survive the demolition process. The Duffys lived in the home for more than 50 years. A couple from Ballard recently bought the house and chose to turn the bar area into a playroom for their children. Luckily, rather than just tearing the bar out and sending it to the dump, the couple called Ballard Reuse, which saved as much as it could. The piece needs just the right space. At 43 inches tall and 5½ feet deep, it takes up a considerable amount of room. The curved outer edge measures 10 feet, 9 inches long. The bar can be yours for $1,500. Pair it with the side table for another $75, and create a swanky, stylish seating area. Invite some friends over, open your favorite whiskey and enjoy. This is the beauty of salvaged goods. With the right home, this bar’s story will continue — far from the landfill. Paige Collins is a Seattle Times features producer. Reach her at pcollins@seattletimes.com or on Twitter @PaigeBCollins. Bettina Hansen is a Times staff photographer.